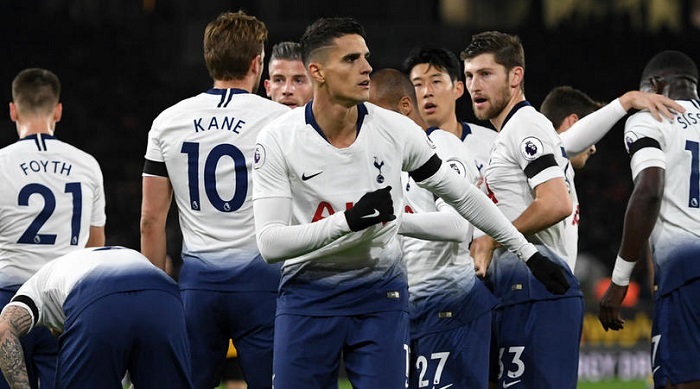 Harry Kane’s second-half strike ultimately proved the difference as Tottenham Hotspur hung on for a thrilling 3-2 win at Wolverhampton Wanderers. Mauricio Pochettino’s men were made to work for three points as Juan Foyth, on his maiden Premier League start, conceded two penalties from which Ruben Neves and Raul Jimenez eroded a three-goal buffer. The match started on a sour note for Tottenham with an ankle injury cutting short Mousa Dembele’s 250th club appearance. The tide would have turned after the restart if not for Hugo Lloris, whose trio of fine saves took on extra significance as Kane fired in at the second attempt following Lamela’s lead-up work. Foyth’s rash challenge in the box allowed Neves to finally beat Tottenham’s skipper seven minutes later and the Argentine defender was at fault again 11 minutes from time, gifting Jimenez the final consolation after bundling over Jonny Castro Otto.